BALLINA is the "silent centre of homelessness” on the North Coast, according to the executive officer of St Vincent de Paul Society on the North Coast, Michael Trimbrell. He said Vinnies figures gleaned from its welfare programs, combined with the latest census figures, showed there were at least 240 people sleeping rough in Ballina Shire, and that doesn't include others who were couch-surfing or sleeping in their cars. But Mr Timbrell said, unlike Byron Bay, homelessness in Ballina Shire was hidden. Mr Timbrell made these comments last week while launching a new service for homeless people in Ballina Shire. 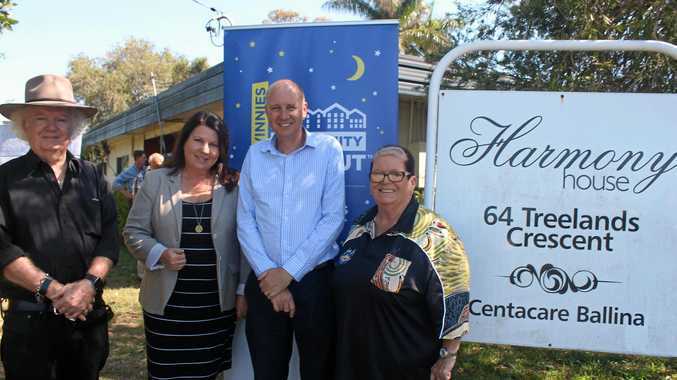 Vinnies is set to redevelop the Harmony House property on the corner of Moon St and Treelands Cres in Ballina to provide a weekday drop-in centre in which homeless people can wash their clothes, have a shower, have a light meal and access support and medical ervices. The new-look Harmony House also will provide a three-bedroom short-term transitional accommodation for men who are referred to the service. Harmony House is owned by the Catholic Church's Ballina Parish and is providing the property to Vinnies at a nominal rent. Vinnies is funding the $150,000 re-development of the property, and also has allocated $100,000 for the daytime service and will be seeking community support the centre is operating. "Providing interim accommodation gives vulnerable people a safe place to rest their head, while the drop-in services provide the personal dignity that everyone deserves,” Mr Timbrell said. Ruth Powis, a homeless support worker from the Jali Local Aboriginal Land Council, echoed Mr Timbrell's estimates on homelessness in Ballina Shire. She said the new service was "badly needed”. "It'll be brilliant,” she said. Ballina's mayor, Cr David Wright, also supported the new service, saying that 18 groups of homeless people had to be supported when the former Teven interchange rest area had to be closed to make way for the new highway service centre. The redevelopment of Harmony House is expected to take six months. Vinnies-run centres in Tweed Heads and Coffs Harbour are seeing 40 to 80 people visit each day.